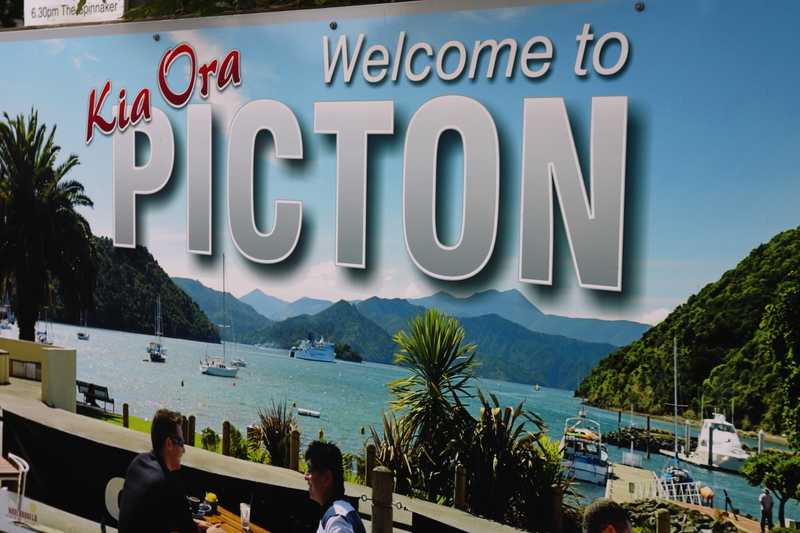 Picton is a harbor village that serves as the New Zealand’s south island ferry terminal. It is also the start of the Queen Charlotte hiking track. This was the one port that we had not scheduled a tour. One of the main excursions is taking the vintage train to the Marlborough Flyer Wine region. But since we had just done a biking wine tour we skip this tour. We headed to the Picton I-Site information booth and arrived prior to them opening. We decided on two options: sea kayaking or taking a boat to the start of Queen Charlotte track. Mr Travelmista was not thrilled with the sea kayaking. We have done this before in Ketchikan AK. So we opted to take the boat to Queen Charlotte track. In hopes that we could hike a small portion. We were able to book the tour at the information booth for $120 USD. The sea kayaking was a tad more expensive. Before the boat left we had some time to explore Picton. But because we had arrived early all the shops were closed. We headed over the big bridge to the Marina and took the hiking trail to Bobs Bay. By the time we made it to Bobs Bay, it was time to turn around and hurry back to the marina. Bobs Bay looks like a nice swimming beach with bathroom facilities but our visit was very short. When we made it back to the Marina the boat was already boarding. Even through the boat had an upstairs, it was already filled by the time we made it back. We ended up with the last seat inside near the driver. The ride out to Ships Cove was long and while the scenery was nice. It was definitely not the adventurous trip. By the time we made it the Capt. Cook Monument at Ships Cove the Ship’s captain only gave us 20 mins to explore. He also told us not to hike Queen Charlotte Track. This was a major disappointment as it was whole reason we want to take the boat out to see what the track was like. We used the bathroom facilities took our shoes off in the bay and took some pictures. By this time it was time to get back on the boat. This time we decided to arrive early and were able to sit on the back of the boat. The ride back was the only saving grace for this excursion. Half way back, Dolphins started to follow us and do tricks in the water. It was the best thing about the excursion. It was a disappointment and we had wished we had more time to explore the track. Next time we will book ahead and do the sea kayaking. Once we were back in Picton the downtown area was in full swing. The had a very nice local handmade market near the Marina. Make sure to bring cash as some of these places don’t take credit cards. We did some gift shopping and then toured the downtown areas shops on High St.
Now this is a funny thing to write about but make sure you check out the high tech public toilets near the Marina. We had a good laugh at music playing once the door closed. For public toilets they were very nice. As we were heading back to the ship, we walked behind the i-site visitor center they had a cute kids train ride, splash pad and sailboat pond. I couldn’t believe there was no line for the train and asked if adults could ride. I paid my $.50 and jumped on the next train. This was a fun cheap thing to do for adults or kids. The kids could spend hours playing in the park. The people in Picton were extremely nice. Everyone went out of there way to make you feel welcome. As we were getting off the cruise ship they pinned all the women as small flower boutique. You can see it in the pictures. This was to let everyone know you were a visitor from the cruise ship. We have cruised all over the world and have never been given flowers. It was a very nice touch for the city of Picton.